Involving the public in citizen science projects benefits scientists because we get more data points to play with, but it also helps create a more scientifically literate society, which is the kind of society I want to live in. Through science communication and outreach efforts since my undergraduate days (see some examples here and here, and my Media page), I’ve tried to make my research accessible to the public. Now I’m trying new ways to get people more directly involved in the process of my research, so they can become stakeholders in scientific research and we can have fun together. Here’s a brand-new crowdsourcing initiative from myself and collaborators Lindsay Zanno and Tom Holtz! 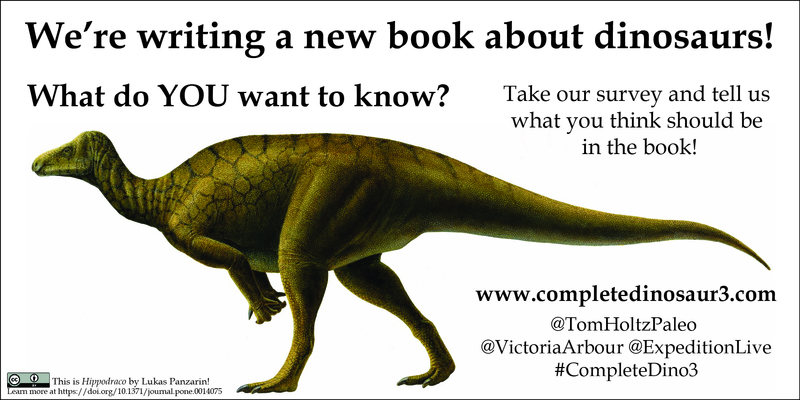 We’re seeking input from future readers of the third edition of The Complete Dinosaur. Help us make this the best book about dinosaur palaeontology by taking our super short survey, and find out more at the book’s website. Since January 2016 I’ve been collecting information about how ankylosaurs are portrayed in the popular media. If you’ve got a book, video, poster, or any kind of piece of art or text that talks about ankylosaurs fighting ANYTHING, you can tweet it to me or tell me about it in the comments at this blog post. I’ll be using this information to develop hypotheses of ankylosaur intra- and interspecific combat behaviour!